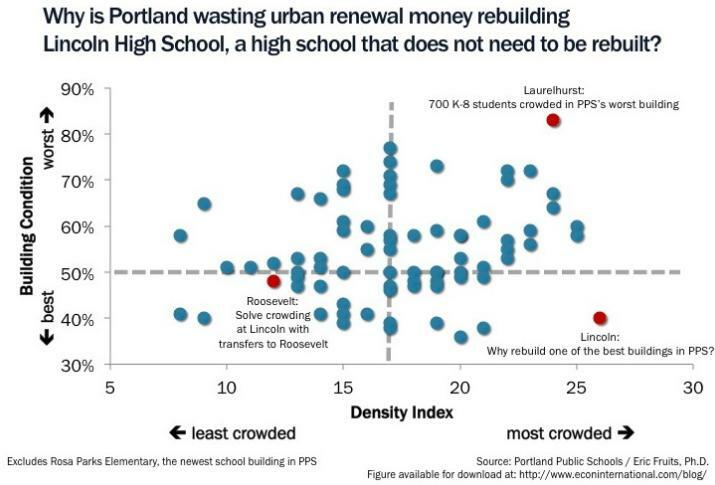 Why is Portland rebuilding their best school? “Education” Urban Renewal Area question of the day: Why rebuild Lincoln HS? One of the curious pieces of the proposed “Education” Urban Renewal Area is a chunk of money flowing to Lincoln High School. The ins-and-outs of how that money will flow to the school district have not been made public and there is some concern that any giveaways to the district may run afoul of state property tax limits. The biggest question of all remains: Why rebuild Lincoln High School? While the district get’s $14.5 million from the urban renewal area, it will be on the hook for another $100 million (give or take) to rebuild a school that does not need to be rebuilt. Take a look at the figure. Sure, Lincoln is crowded. It is one of the most crowded schools in district’s portfolio. But, the condition of the Lincoln building is one of the best in the district’s portfolio. Crowding is not a building problem, it’s a school assignment problem. Many Lincoln students actually live closer to Roosevelt High School. A simple transfer will relieve the crowding and save about $100 million.